Edith Windsor is my new role model. Edith Windsor and Thea Spyer spent forty years together before legally marrying in Canada. Two years after their wedding, Thea passed away due to escalating complications resulting from Multiple Sclerosis. Even though the state law in New York, where the couple lived, recognized their Canadian marriage, the federal government issued Edith with $363,053 tax bill. The bill, in the tune of hundred of thousands of dollars, would not have been issued had the two women been in a heterosexual marriage. “I couldn’t believe that our government would charge me $350,000 because I was married to a woman and not a man,” Windsor, 81, said in a video statement from the American Civil Liberties Union, which is helping to represent her. When Edith filed a lawsuit against the federal government, President Obama was forced to reconcile his opinions on the constitutionality of such a law that would charge a partnered widow of 42 years who lived in a state that recognized her international marriage nearly $400,000 for the sole fact that her deceased partner was not a man. When you put the issue in plain English like that, there’s really not much to be said in defense of such a law. It’s unconstitutional by any measure. It’s also just wrong. It’s mean. It’s UnAmerican. Windsor’s suit to reclaim Spyer’s money from the U.S. is one of two cited by Attorney General Eric Holder in a Feb. 23 announcement that President Barack Obama’s administration would not defend the law in court. The U.S. won’t argue the act is constitutional in Windsor’s case in federal court in New York and in a Connecticut case involving seven plaintiffs, Holder said in a press statement and letter to House Speaker John Boehner, an Ohio Republican. Notices went to the judges Feb. 25. 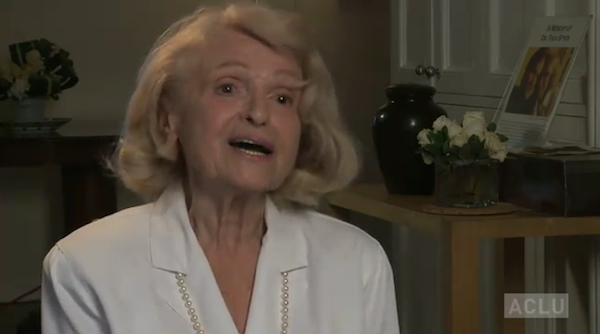 We’re so proud of Edith Windsor for sharing her beautiful love story and your memories of Thea Spyer with us. Thank you so much for standing up for your rights, for all of our rights, and for what’s right. You inspire me, Edith.